There's the loom line up. A beautiful day with patio doors and windows open for the warm breeze, good tunes on the player and the room freshly tidied. There is a possible offer on the Woolhouse down at the far end and I won't know for sure until July. 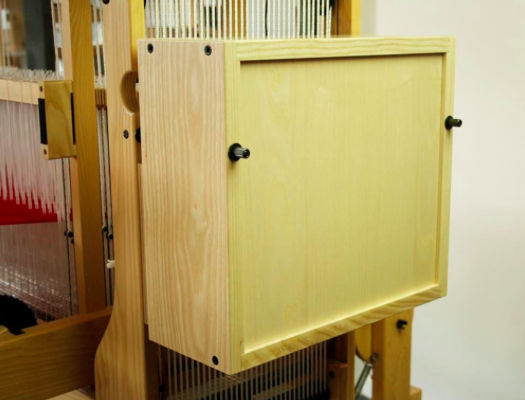 (The loom is available again ) The Louet Spring in the middle has a silk warp under way. Yes, that is a live weaving program on the screen there next to the Megado and weaving is once more under way! It was quite a process to get it to this point. First of all you avoid dealing with it for months, then you make a feeble attempt just before you have surgery and Christmas and it was obviously doomed to fail. I worked on getting the sixteenth shaft aligned properly. Then next up was making my mind up as to which version of Fiberworks I was going to use. PC or Mac. Having seen both versions of the program, I decided Mac all the way, in both design and weaving operation. The chain of stores ALL closed their doors as they under go a reorganization and will remerge as another chain of technology stores. "We thank our customers for their patience". Next up in this little drama is the various diagnostic testing to see if everyone is happy and shaking hands with each other! Found the right comm port right away! Since I only have two USB ports I had a 50/50 chance of getting it right. Yeah me! Then I ran the solenoid test. The solenoids are like little 'wack-a-moles' that fire when the computer tells them to, from the pattern it has in the draft, pic by pic. They jump out and hit the back of what looks like piano pegs and then a knife like blade moves up and down as you treadle and collects the screw heads on the other side of the pegs that are sticking out proud and then releases the screws when the blade moves past another sensor. Well its supposed to.... the treadling sensor diagnostic test failed. So it wasn't the computer at fault, and all parts of the loom were functioning properly except for the blade and the magnet. The magnet is what tells sensors to release the 'pegs' at the right time. Its small, very strong and apparently in the wrong place. So? place the magnet on top of the blade or underneath? A simple question right? no.... I had to read through the older manual that came with my loom. A second newer manual for later models, surf You Tube in vain for Megado how- to videos, join a multi shaft comps / dobby group on Facebook and spend time browsing on the internet looking for pictures. Finally I found a how to guide in Dutch for the older model interface on the Louet European web site and found that the magnet goes on the inside of the blade. They show a white magnet in this picture, but mine is black on a black bar. 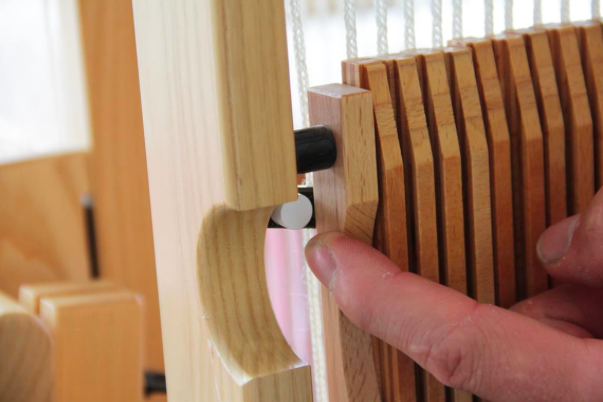 You can see the piano pegs that the solenoids hit and below you can see the interface (like mine) placed back on the side of the loom. The magnet is tucked behind the cutaway. Except on my loom the blade and magnet won't freely slide by the sensors and it jams up. The fact it would not slide freely is what caused my confusion as to which side it belonged. So we undo two small dark screws at the bottom of the interface out by one small turn and put it back on and the bottom edge is now out a smidgen and the blade / magnet combo clears! We had a break and a discussion about the various possibilities. Bruce had mentioned something about positive and negative polarities and so I just reached in and flipped the magnet over. We cautiously smiled to our success as we were worried about what was next to go wrong. Earlier that day I had dropped my iPad onto a tile floor corner point down and it was not turning back on. It was a "black screen of death" for hours until I gave up on it. Of course later the same day when I took it in to be looked at by a techie, it worked perfectly like nothing was ever wrong. In fact if it wasn't for the slight ding at the corner, you would never know. 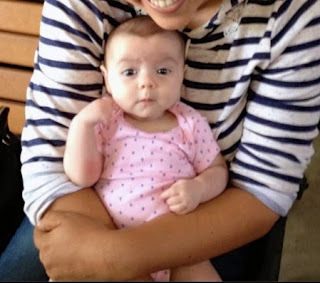 So was it worth going to all the this trouble and steep learning curve? Yes.... the Mac program and its commands are much simpler than the PC version, well at least to me me that is. I was able to set the ranges for what portion of the draft I want to weave right away and now I have to learn the finer points of un-weave vs. reverse and few other points. I have a narrow 2 inch warp on the loom for 12 shaft twill book marks and the neat thing is I can start and stop where I need to as I learn and makes mistakes. If I do get a full one all woven up, then its a bonus! I'm already thinking of what to weave next on the Megado and I think it might well be more towels as they are a great fresh start experience until you get all the nuances of the loom and the way it feels as you operate it. Thomas the Tank bicycle for Ethan's 3rd birthday. ...and little Madison is now 2 1/2 months old and very much all girl. 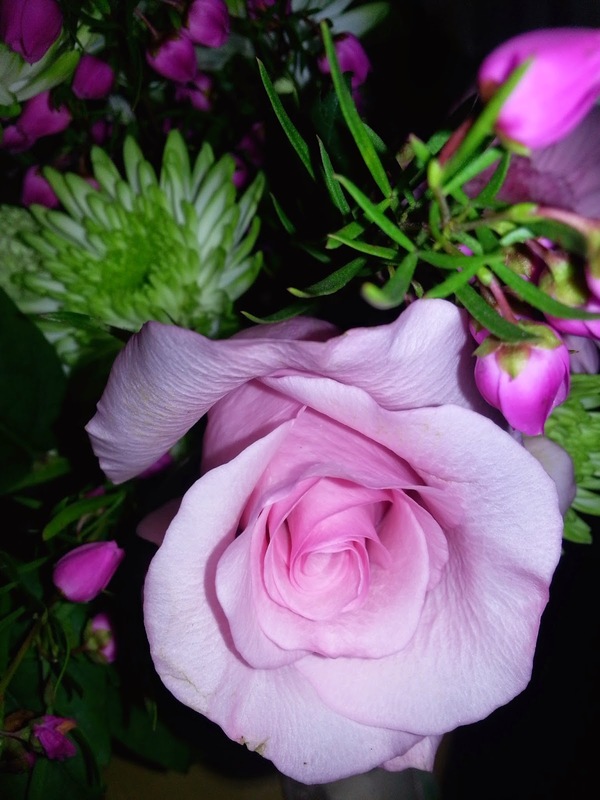 I hope your 'April showers' brought you 'May's flowers'. Are you following the television show Outlander? Are you a reader of Diana Gabaldon's series of books? I have been reading them for years and so the show is a nice extra! I must admit to watching and thinking... "hey, that wasn't in the book..." but they can't always translate every detail through to a show or it will take a zillion years to get the nine (yes- 9 and counting) books out! I have always loved the interplay of colour that comes with plaids and tartans. 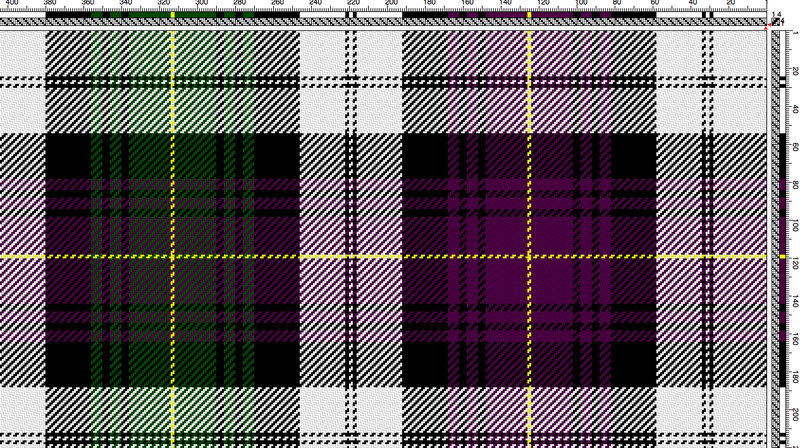 Now, if I recall rightly, a plaid is any arrangement of stripes of colours that is also UN-registered. 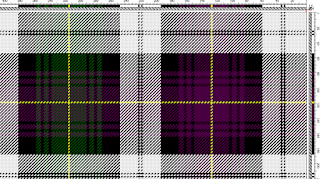 A tartan is an officially registered colour arrangement and associated with a clan, organization or person. Well, I think this is right. This Wikipedia post helps define the terms and history. 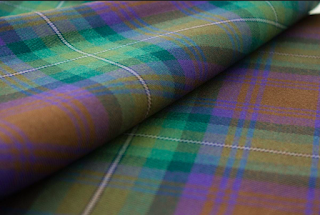 You can also visit the Official Scottish Register of Tartans some time and browse. The Scots went around the world after the Battle of Culloden in 1746 so most people can find a wee bit o' the Scots in their ancestry! 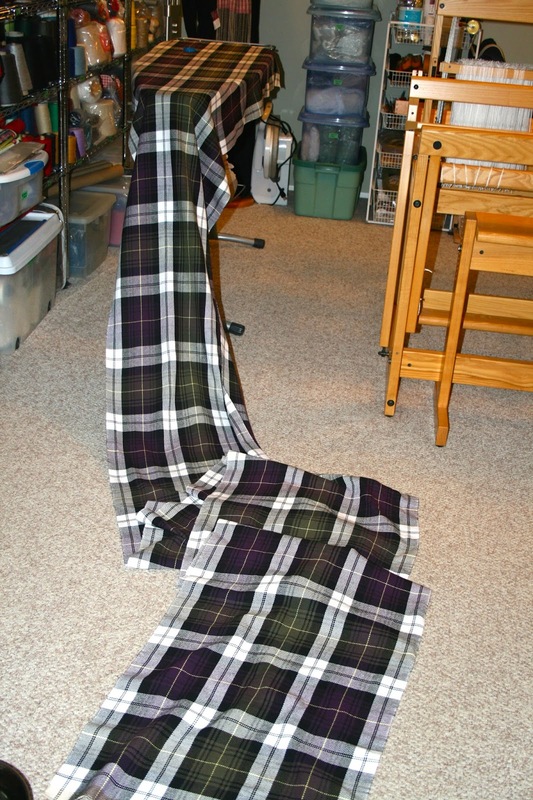 A few years ago I wove up Mackenzie #2 tartan as part of a towel exchange for the Guild of Canadian Weavers. It was bright and bold and challenging to weave. Here it is on the loom and under way. A true twill line is forty five degrees and you must be careful not to pack the selvedges in. Sett is really important and regular even beat! It was the first time I wove a long length of yardage and then cut apart for towels after. I had recently purchased a warping mill as it was hard to stand still in one spot to wind a warp on the board. 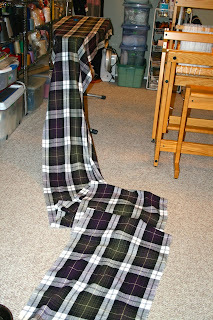 This plaid was my inaugural warp on the mill and I was up to speed in no time! It just takes the threads and spreads the warp nicely and gives you a firm base on which to make a start! I did use a temple as "draw-in" happens! I just repeated the basic colour line up in the warp and repeated over and over again.... for all 8.3 yards! This is 8/2 cotton from Brassards in Quebec (love their quality!) and sett at 24 epi. I used a twelve dent reed. The warp is just over twenty five inches in the reed. I'm allowing for draw in and shrinkage. I planned for seven towels at thirty four inches each (before hemming) and twelve inches for some samples (plus twenty inches loom waste). Okay... the weaving part. I sat when ever knee and time, or even mood, allowed. So it did take some time to slowly work through. We had a trip away to see my father one last time at the hospice. That was, to put it mildly, a gut wrenching experience and I came home quite numb. It was wonderful to have the (sometimes frustratingly) endless repeats to focus on and simple weave away, and weave some more. Soon I noticed the warp roll at the back was much slimmer and the cloth roll getting some nice heft to it! I wove right to the back of the four shaft heddles and used a stick shuttle for the last few inches . I cut it off the loom and had a literal arm load of fabric! I had scrap yarn at the start and end of the warp which I serged neatly and then popped it all into the washing machine for a soak and wash. After coming out of the dryer I pressed it all using steam. Its time to cut the towels apart. 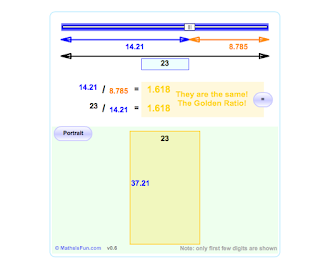 I measured the planned thirty four inches but it ended in the middle of a pattern area. 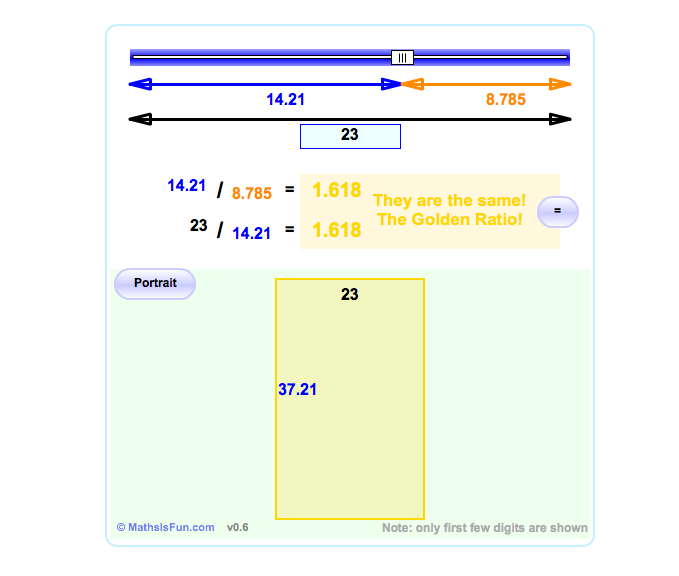 I guess that's okay but remembered my post about the Golden Mean and thought I would use the computer program to help me with a nice proportioned towel. The twenty five inches at the reed was now twenty three inches after washing and pressing and as you can see from the picture below, it recommended thirty seven inches! Way too long! Then I noticed that thirty five inches ended in a good spot with a natural cutting line.... all along the entire warp! So white section of hem on one side and the ending of a large dark colour block on the other. It works! So I got busy and started removing the scrap yarn sections and cutting apart towels. I ended with six towels and some small amount of samples. Where did towel seven go to?? I ran through my calculations again and I had done them correctly.... so it would seem the take up for a 2/2 twill is far greater then allowing for three inches for every yard woven. Even allowing for the additional six inches lost to slightly longer towels. An entire towel's worth in fact! Geesh. I did a simple small turn over for hems and pressed and pinned them. One end was stitched using white cotton thread and the other end black thread. This meant that half was done by day light so I could see and the other could be done while we watched TV. They were already washed so a final steam press was all they needed. Time for their "beauty shots"! The cloth is lovely and soft to the hand, drapes well and the interplay of colours is lovely. Here are four of the towels as the last two are to be hemmed still.